Do you ever feel like your child's toy collection is taking over their room, or even your living room? This storage cube makes cleaning up clutter in your home a fun game that the whole family will enjoy. Whenever you want this storage bin and toy organizer folded down, disassembly is as easy as pulling out the fabric covered stability square, and fold the sides in to let it lay flat. Assembly is as simple as just unfolding the sides, and inserting the support square. 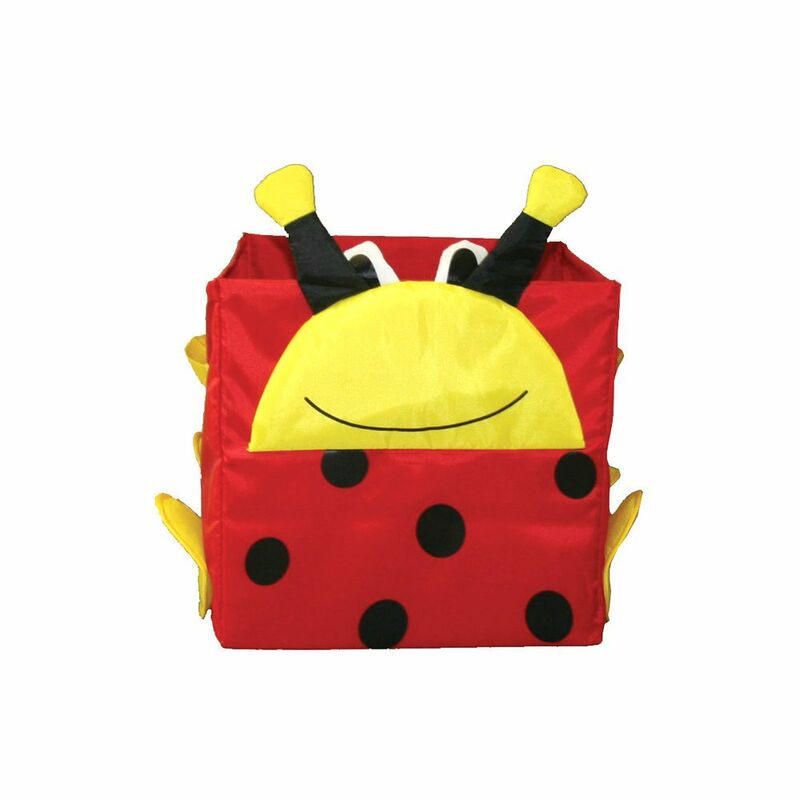 This Bean Bag Chair with removable cover is a comfy and fun place for your child to sit and relax. This bean bag chair gives your kid their own soft space to sink into a book, play a game or watch TV or a DVD. Its soft fabric wraps your child in a hug as the interior beads cradle and wiggle around them as they move. This lightweight chair makes it easy for them to carry their bean bag from room to room. The smart, locking zipper means your child can't unzip the interior. This bean bag chair is covered in an soft fabric that they'll love and safe for you to wash. Plus, it's low to the ground and a soft place to land, so it's a safe seat for the littlest ones. This bean bag is so large, you'll fit in it too. The Kids Folding Table and Chair Set is kid sized to give toddlers and small children their own special table and chairs.Four metal folding chairs (Blue, Green, Red and Yellow), with upholstered seats and backs that match the frame colour and complement the folding table. The table has a padded, blue vinyl cover that makes clean up time a breeze. A powder-coated finish on the table and chair legs protects them from scratches. Plastic floor glides protect your floor by sliding smoothly when you need to move the set. This set can be used indoors or outside and is easy to fold up, transport and store. This folding table and chair set gives your little ones a comfortable place to play, colour and eat at family gatherings. Honey-Can-Do SRT-01603 Kids Toy Organizer and Storage Bins, White/Pastel. The perfect organizer for children's playrooms or bedrooms, these colourful bins make organizing fun and easy, even for small kids. Effortlessly sort doll clothing, toys, craft supplies and more into the sturdy plastic bins. The white wood frame holds 12 containers of varying sizes to keep everything tidy. Each bin measures 5 inches high, providing ample storage space for both small and medium size toys, books, clothing, and more. Bins are removable from the shelves making clean-up time fast and simple. Honey-Can-Do SFT-02166 3-Set Modular Storage Cubes 14 inch, Translucent Pink. The customizable unit features three 14-inch cubes that can be set up in a variety of ways-one next to two stacked, three set horizontally, or three stacked vertically. Great for getting kids and teens organized; whether it's in a bedroom, play room, or dorm this durable storage system keeps books, toys, and clothing neat and orderly. Works well on the floor or as a closet shelf organizer. Translucent plastic panels incorporate a steel frame covered in heavy-duty zinc and are assembled together using white plastic connectors. The unit cleans up easily with a damp cloth as needed. Combine multiple sets for even more storage capacity. Toy Storage Cube, Lady Bug Do you ever feel like your child's toy collection is taking over their room, or even your living room? This storage cube makes cleaning up clutter in your home a fun game that the whole family will enjoy.